For the past week, SSD Fire has been in “leave it” boot camp. He has had to calmly walk past piles of treats on the floor. He has done “sit,” “down,” “stay,” “come,” and “heel,” all while ignoring piles of food on the floor. Why is Fire working so hard on “leave it”? He’s going to Keystone Human Services’ Chocolatefest on Sunday at Hershey Lodge! Chocolatefest is a day of tasting chocolate created by area restaurants, caterers, hotels, and confectioners. It’s a chocolate lover’s dream! For an hour and a half, you can visit over 60 chocolatiers and taste the chocolate treats they’ve prepared. Many are sweet, some are savory, and all are delicious! Fire, however, will not be eating any of it. He’ll have to ignore any food that accidentally falls to the floor. Instead, he’ll be joining some of our other SSD dogs at the Susquehanna Service Dogs booth. You’ll be able to meet several of our dogs, including Gideon, Meade, Rossi, Julia, Parks, Kiwi, Lagoon, Falstaff, Lil, Bodi, and Steel. You can buy tickets for Chocolatefest online until 11 a.m. on February 1. Tickets are also available at Hershey Lodge, Giant, Turkey Hill Minit Markets, and Boscov’s. Tickets may be available at the door. We hope to see you at Chocolatefest! 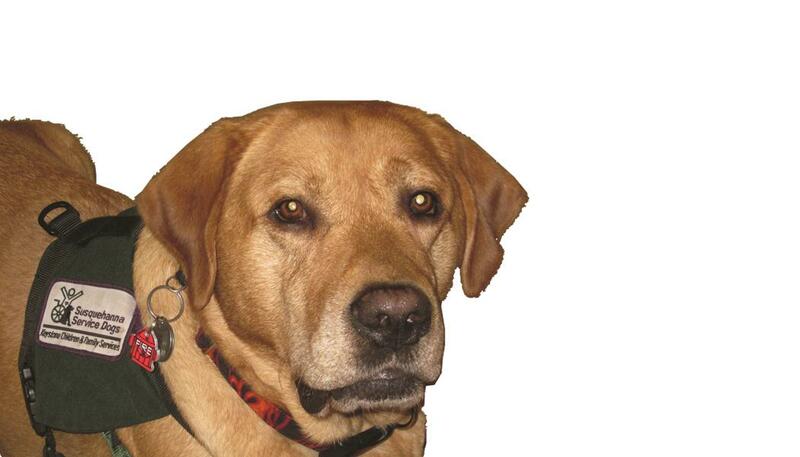 Find this image of SSD Fire on the PawsAbilities website and you could win a prize! Where’s Fire? SSD Fire is hiding somewhere on the PawsAbilities website. Can you find him? Every Wednesday until PawsAbilities on March 9-10, Fire will be hidden in a new spot on the www.pawsabilities.net. If you correctly find him, you’ll be entered to win a free spin at Paw Draw, a game where you can win prizes like dog toys, treats, collars, and more! Every Tuesday at 1 p.m., we will randomly select two people to win a free spin at Paw Draw! Winners can pick up their free spin tokens at the Information Booth at PawsAbilities on March 9-10. Visit www.pawsabilities.net to play Find Fire. Don’t forget to buy your PawsAbilities tickets! It’s cold here in Harrisburg! We don’t know about you, but when the temperature drops below 20 degrees (and feels like 5 degrees! ), we certainly don’t look forward to taking our dogs out for a walk or any kind of exercise. And some dogs, especially puppies, may not be able to spend as much time outdoors in the cold weather. That means, however, that dogs have lots of extra energy, which increases the chances that they might get into mischief. Here are 7 ideas for using up some of that extra energy. If you have an SSD dog, they’re also great training games. Create an obstacle course for your dog to go through. Set up a variety of obstacles for your dog to go over, under, around, and through. If you have an SSD dog, take advantage of the cues your dog knows. For example, start with your dog by your side, leashed or unleashed. Walk a few steps and ask your dog to “sit.” Walk a few more steps, then ask your dog to go “up” (two paws on an object) or “all the way up” (all four paws on an object). Walk a few more steps and ask your dog to go under a table or a chair. Have your dog “go on through” a doorway or between two chairs, then ask them to walk backwards for a few paces, then “heel.” You can add some different surfaces for your dog to walk over, or you can go up and down the stairs. Any time you’re walking in an open space, randomly ask your dog to “sit” or “down.” You can make the obstacle course even harder by scattering treats on the floor so your dog also needs to practice “leave it.” Be creative and don’t forget to click and treat! If you have enough open space, you can work on your dog’s play retrieves. Just pick your dog’s favorite ball or toy and toss it for them to chase and bring back you. This is one of SSD Fire’s favorite games! Not only is hide and seek fun, but it’s also a great way to practice stays and recalls! The first time you play this game, start simple. Put your dog in a down-stay or sit-stay and walk a few steps away. Call your dog to come, and click and treat when they do. Gradually move farther away, then move out of sight, whether you move behind an object or go into another room. If your dog has trouble finding you, say his or her name again. Shaping will not only get your dog moving, but it’ll get him thinking, too! Shaping is a training method where you break down a behavior into small steps, and then you reinforce the dog for these small steps until you achieve the actual behavior. We want dogs to experiment with different behaviors until he finds the one that earns him a click and treat. You can shape almost any behavior. You can have your dog touch his nose to an object, rest his chin on a chair, put his paws inside a box – anything! Start with something easy, like touching a nearby object, and work up to something harder. Mental exercise can be just as tiring as physical exercise. Add a few extra training sessions to your day, or teach your dog a new trick. If you have an SSD dog, go to the mall and walk around. Work on your dog’s cues in real life situations. If your dog is a pet, take them to your local pet store. Or take your dog swimming at the Canine Spa in Dillsburg. This indoor facility is the perfect place to exercise and socialize your dog. Just be sure to dry your dog off as much as possible before leaving. Treat dispensing toys are great because they make your dog work to get the treats. We especially like ones that make the dogs walk around in order to get the treats out. Sometimes, instead of giving the dogs all of their dinner in their food dish, we’ll put half or most of it in a treat dispensing toy. It lets them work off some energy and helps manage their weight. We hope you have fun with these ideas! If you try one of them, let us know how it went. What other indoor games do you play with your dogs? Let us know in the comments. SSD Kiwi demonstrates her "leave it" skills at puppy class. SSD Irwin walks over a grate - no problem! SSD Irwin practices going up open airway stairs. 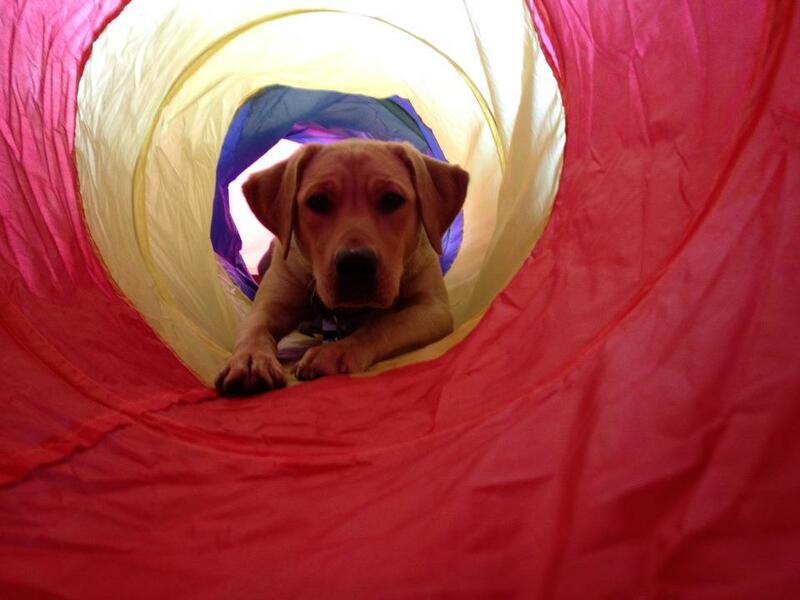 SSD Rizzo doesn't mind small spaces like this tunnel. 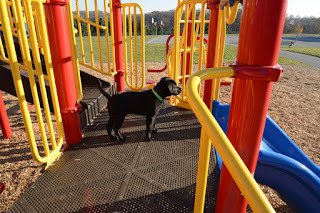 SSD Dublin checks out all the interesting surfaces at the park. Now that the holidays are over, we’re going to return to our series about service dog house manners. So far, we’ve discussed general house manners (Mind Your Manners) and no jumping (Four on the Floor: Training YourDog Not to Jump). 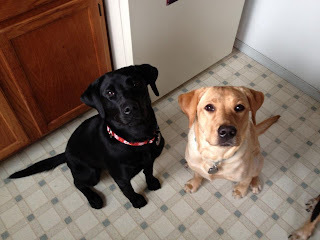 Since it’s getting close to lunch time, and we’re feeling a little hungry, we’re going to talk about canine kitchen manners, specifically manners during people food preparation and countersufing. Contrary to what many dogs might wish, countersufing (jumping on counters to investigate and/or steal something) is not a canine sport. Our dog learn that they must ignore things on the counter and stay out of the way when their puppy raiser or partner is preparing food. During food preparation for breakfast, lunch, or dinner, dogs should not be underfoot, standing next to you, or sniffing at the counter. In fact, you should be able to leave food on the counter and walk away without your dog countersurfing or stealing the food. You should be able to leave steaks out to thaw all afternoon or store your apples in a fruit basket without worrying that your dog will jump up and swipe them. To teach good kitchen manners, we start by leaving young puppies in a crate in the room while we’re preparing food. Once they learn the “go to bed” cue, we can use that to keep the dogs in one spot. “Go to bed” means that the dog goes to a designated bed or blanket, which can be in the kitchen, lies down, and stays there. If the puppy is out of his crate and starts sniffing or jumping on the counter, we use an “eh eh” sound to let them know they shouldn’t be doing that behavior, and we reward them when they keep all four paws on the floor. If an older dog jumps up on the counter, it’s perfectly acceptable to use a loud “Hey!” and gently use their collar to pull them off. These rules about countersurfing apply for food, toys, and anything on the counter or table. It’s very important to teach a dog not to investigate counters and tables. A dog that countersurfs may not be able to be placed as a working service dog. Their future partner may not have the physical strength to remove the dog from the counter. 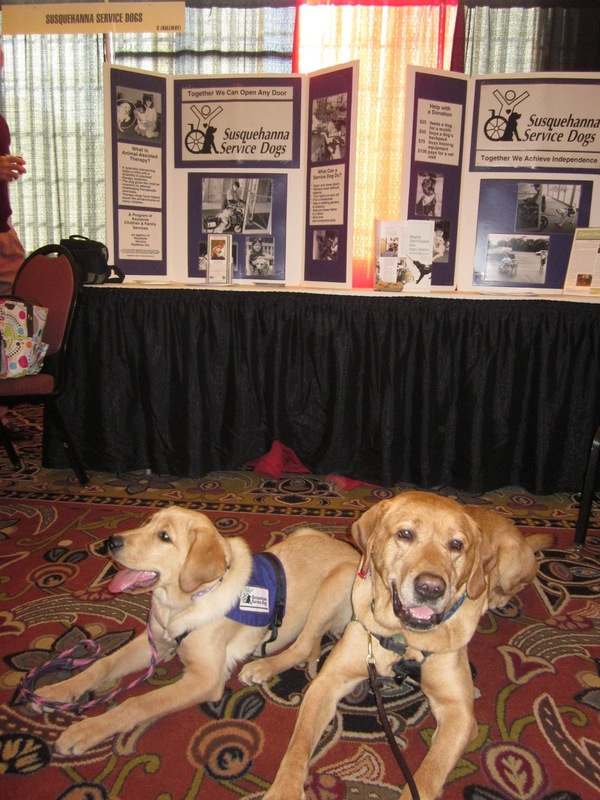 Plus, service dogs are supposed to fit seamlessly into their partners’ lives and to help them be more independent. Providing someone with a countersurfing service dog would only add additional stress to their lives. By teaching service puppies in training that countersurfing is not a sport, they will be well on their way to becoming a service dog and changing someone’s life. 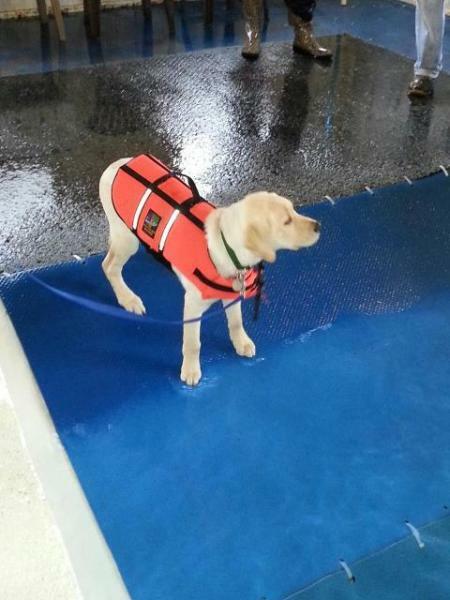 Meet SSD Lagoon, a playful, curious puppy in training from the Water litter. At three and a half months old, Lagoon is like a sponge, soaking up all kinds of skills, behaviors, and experiences. 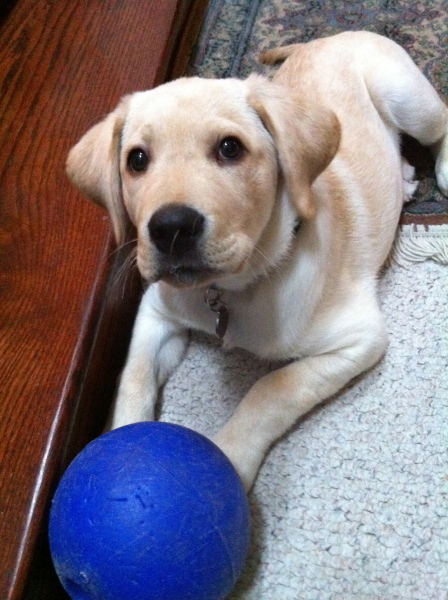 Right now, she and her puppy raisers are working on play retrieves and recalls. They often go to the dog park to practice, which also gives Lagoon the chance to meet other dogs. Between practicing recalls and retrieves, meeting other dogs, and just generally playing, Lagoon is one sleepy dog afterward! They are also working on the cue “go to bed.” When Lagoon fully learns this skill, she’ll go to a designated bed or blanket, lie down, and stay there for an extended time. This is an extremely useful cue for the dogs to learn. Among other things, it can be used to anchor the dog when visitors arrive, or to keep the dog from getting underfoot while someone is preparing food in the kitchen. In addition to going to the dog park, Lagoon has also gone Christmas shopping with her puppy raisers, and this past weekend, they went to the Pennsylvania Farm Show. Lagoon met a donkey, saw cows, sheep, and other animals, and got lots of practice walking calmly through crowds and interesting smells. 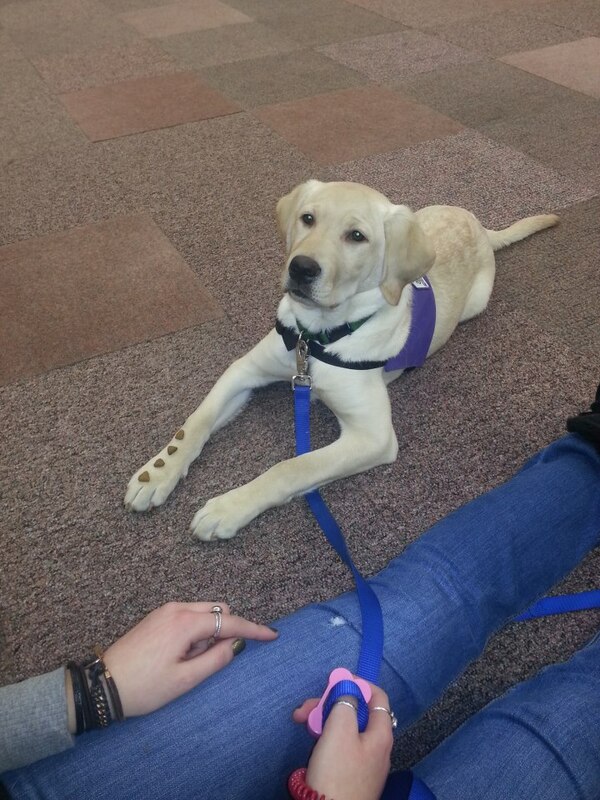 Monday to Friday, Lagoon goes to work with her puppy raiser. She’s getting lots of experience relaxing in an office setting. One day, she may need to accompany her partner to work every day, and she’ll need to know how to spend the whole day sleeping, or at least relaxing, under a desk or in an office. Constant practice means that she’ll fit seamlessly into her new partner’s life. Until that day, though, she’s learning as much as she can, and her puppy raisers are having fun watching her grow and learn every single day!